Seed-feeder and case-bearer: The eggs are laid on the florets of goosefoot and orache (UKMoths). 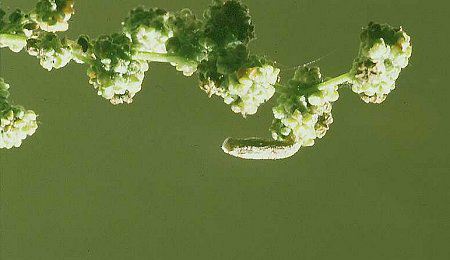 Larva feeds on seeds. The full-grown case is 6-7 mm long (British leafminers). Larva: The larvae of moths have a head capsule and chewing mouthparts with opposable mandibles (see video of a gracillarid larva feeding), six thoracic legs and abdominal legs (see examples). Pupa: The pupae of moths have visible head appendages, wings and legs which lie in sheaths (see examples). Pupation occurs in the case on the ground (UKMoths). Adult: The adult is illustrated in UKMoths. The species is included in mothdissection.co.uk. Time of year - larvae: September to October (British leafminers). Time of year - adults: July and August (UKMoths). Distribution in Great Britain and Ireland: Thought to be locally common throughout most of the British Isles (UKMoths) including Anglesey, Banffshire, Bedfordshire, Caernarvonshire, Cambridgeshire, Cardiganshire, Denbighshire, Derbyshire, Dorset, Dunbartonshire, Durham, East Cornwall, East Norfolk, East Ross, East Suffolk, Flintshire, Glamorgan, Haddington, Herefordshire, Huntingdonshire, Isle of Wight, Kincardineshire, Leicestershire, Linlithgow, North Hampshire, North Somerset, Outer Hebrides, Pembrokeshire, Shropshire, South-east Yorkashire, South-west Yorkshire, Stafford, Surrey, West Cornwall, West Gloucestershire, West Lancashire, West Norfolk, West Suffolk, Westmorland and Worcestershire (NBN Atlas) and Ireland (Karsholt and van Nieukerken in Fauna Europaea). Distribution elsewhere: Widespread in continental Europe including Austria, Croatia, Czech Republic, Danish mainland, Estonia, Finland, French mainland, Germany, Greek mainland, Hungary, Italian mainland, Latvia, Macedonia, Norwegian mainland, Poland, Portuguese mainland, Russia - North and South, Sardinia, Slovakia, Slovenia, Spanish mainland, Sweden, The Netherlands and Ukraine. Also recorded in Near East and North Africa (Karsholt and van Nieukerken in Fauna Europaea). Also recorded in the Republic of Ireland (NBDC interactive map). British and Irish Parasitoids in Britain and elsewhere: Currently unknown.